Microsoft Dynamics SL delivers the flexibility and agility that growing companies need to support business today and to be prepared for the future. From financial and project management, to payroll and operations, our quick-to-implement, easy-to-use enterprise resource planning (ERP) solution has the power to support your growth ambition. And Microsoft Dynamics SL works together with Office 365 to extend the value of your business application with enhanced productivity, collaboration, mobility, and business intelligence. With Microsoft Dynamics SL, users can access role-specific information and can perform data-entry tasks, like project time and expense entry, project approvals and setup, and analysis—all from a smartphone, tablet, or desktop. Microsoft Dynamics SL can be deployed in the cloud on Microsoft Azure, hosted by one of our reselling partners, or on your servers. Start with what you need today, and easily adapt as your business grows. Construction. Help increase sales and improve project management, job costing, materials management, and more—all integrated with your financial systems. Government contracting. Complete projects on time, on budget, and to specification—while collecting and retaining the detailed information needed to address and comply with government regulations. Professional services and engineering. Drive better decision-making, manage people and finances, and maintain profitability for client services and projects. 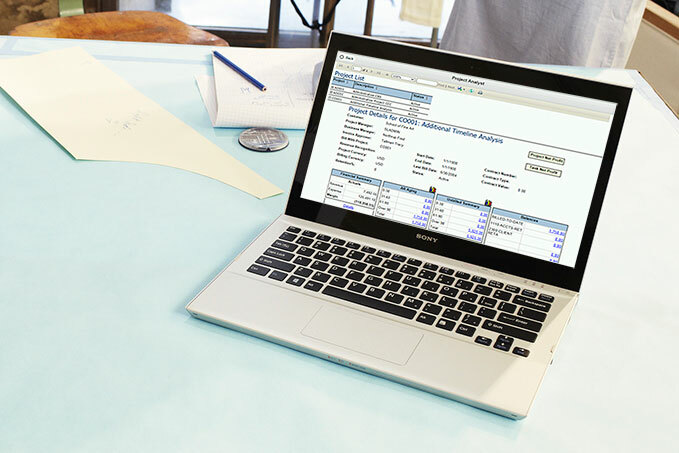 Microsoft Dynamics SL makes managing your project-based business easier. Combine powerful project and financial management capabilities to help businesses manage customer demands, keep up with compliance regulations, and deliver services on time and on budget. Microsoft Dynamics SL delivers powerful project accounting software solutions to improve project profitability and reduce compliance risks. We meet the needs of project-driven businesses! When your business relies on several departments and divisions to complete a project, keeping everyone on the same page can be a daunting task, often resulting in customer dissatisfaction, missed deadlines and unpredictable budgeting. With Microsoft Dynamics SL (formerly Solomon) from Carpenter Associates, you’ll be able to keep everyone connected by streamlining business processes, gaining better insight into project profitability and enabling efficient project collaboration for the best possible customer experience. Discover how Microsoft Dynamics SL from TD Carpenter & Associates can enhance your project management.